Hi Audrey – I love to promote foods and recipes that are “Minnesotan.” One of those is a wild rice salad that includes grapes, though I would never think that would be a primary representation of Minnesota foods. Tater Tot hotdish, it what many people think of first as a Minnesota food. I have that covered as well as Spam recipes (a made in Minnesota food) lefse (and lutefisk!) and so many more foods that I’ve loved over the years. Thanks for being such a wonderful promoter of our great state. I’ve had a chicken salad recipe that included grapes. But, like you, I’d not consider that representative of Minnesota. Hotdishes, yes. I checked out the list. I do not get the one for the state I live in and the other state in my area that I travel a lot to. I get Oregon and Cranberry Sauce, Wisconsin and Wild Rice with Mushrooms and Michigan with Baked German Potato Salad (never had it baked though). Interesting list! I didn’t peruse the entire list. Perhaps I should do so for my entertainment pleasure. Now that your head has appeared out of the snowbank, thanks for your two cents worth. Good old fruit cocktail and marshmallows (yup, part of many a Jell-O salad), so part of my Minnesota memories, too. I have a hard time eating Jell-O now – ha! Me, too. Only when I’m sick. goulash, hamburger rice. So my question is did this man even ask 10 people who live in Minnesota what the Minnesota food might be. Guess he didn’t do his homework very well. As for the recipe in the Gazzette it was a new recipe they were trying to get us to eat did it work, nope. To get you all going how about sauerkraut, horseradish, head cheese, blood sausage, canned beef, these are foods we helped to make as kids in the 60’s and 70’s and it’s why we still get together to do horseradish and tomato juice. There you have it, readers. Direct from my sister with her opinion on Minnesota foods. Thanks, Lanae. I’ve never had Grape Salad or Pear Kuchen but I did find recipes for grape salad and kuchen in all of those recipes that I typed out earlier in the year. Interesting. And what year was the Grape Salad recipe dated from? I’m not sure about the year as it was hand written on an index card but I will share the recipe. I never heard of such a “concoction” until I got married and DH’s mom made it as a dessert!!! I was hooked the first time I had it…..Yum! BUT to have it chosen as THE MN salad…….really??? 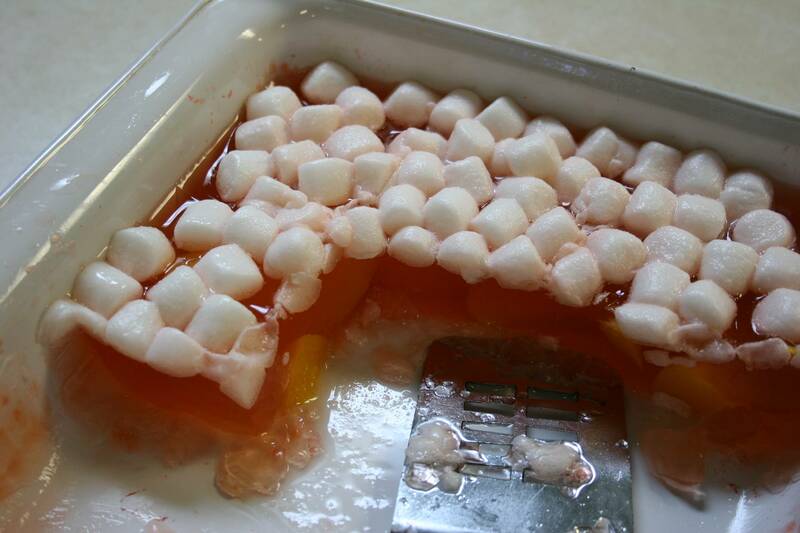 Red gelatin with mini-marshmallows (or any of the Lutheran church basement/funeral salads) would have been what 1st came to my mind!!!! Where do they get such notions???? LOL! ‘Nuf said………. Well, at least you have heard of Grape Salad, ummmm, I mean, Grape Dessert. I agree that Grape Salad doesn’t sound particularly tasty. But apparently it is, according to those who have tried it. Thanks for the explanation on the recipe ingredients. Stuffing, cranberries, mashed potatoes and gravy are the staples on our menu, although I don’t eat cranberries. Those are for the husband. I found your post thanks to Beth! Thanks for sharing your thoughts on Grape Salad. It’s great to hear from someone actually from Redwood County. Well, thanks to Beth Ann for sending you my way, Jeni. Nice to have you here. Isn’t she great? I was asked to bring a grape salad to a potluck last weekend so I went online and found a recipe. It was very easy to make and was very good!! I hadn’t heard of a grape salad prior to that either. There you go, readers, a comment direct from a native Minnesotan now living in Wisconsin. You are absolutely right that this puts Minnesota in the news! But the recipe is totally silly as a Minnesota staple. Should have been some kind of hot dish! Silly is right. Hotdish, yes. I make Grape Salad every Thanksgiving and Christmas. Everyone in the family loves it and the grandchildren argue over who will get the last little bit in the bowl. My recipe is: Red or Green Seedless Grapes, 1 Cup brown sugar, 8 oz. sour cream, 8 oz. Cool Whip. Mix the dressing and then add the grapes. I double the recipe. Delicious. Well, DeLores, this is a surprise. And you live in Redwood County, too. This may just be the latest “hot” new salad in Minnesota. According to my Minnesota born and bred friend, she had it several times as a child and it is in fact a recipe in a 1978 cookbook for tailgating put together to benefit the Minnesota Kicks (former pro soccer league). Thanks for passing this info along. It’s interesting to hear from those who have heard of Grape Salad. Look what you’ve done: Now I’m hankering for some of Mom’s good ol’ strawberry jello with banana slices and mini marshmallows on top. Back in the olden days jello could be a salad or a dessert for our 4H Foods requirements. 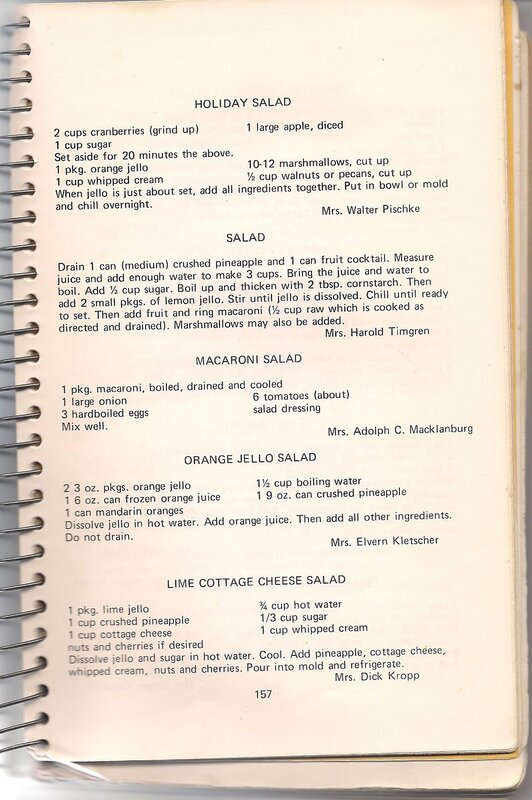 Sunshine Salad (with shredded carrots and crushed canned pineapple) was a favourite of mine. But there is a variation of that with halved red grapes included. Wow! Happy to bring back memories. You’re right. Jell-O could be salad or dessert depending on ingredients added. Hi Audrey. 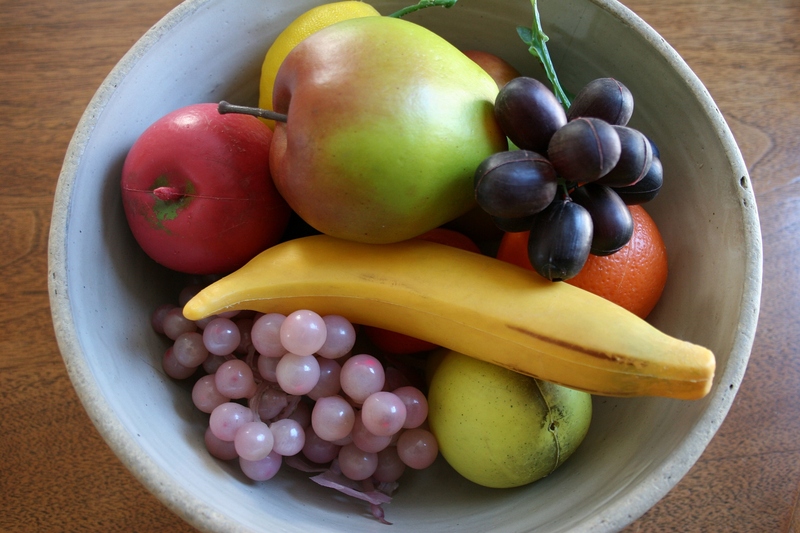 Writing to you from Virginia where I found this post when researching the “Grape Salad” furor. 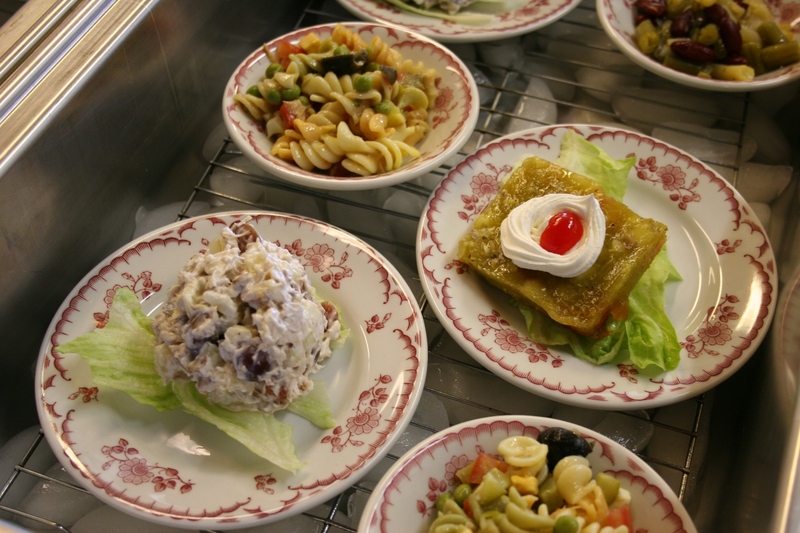 Loved this post and when I was a girl in Minnesota, there was never grape salad anywhere near my Grandma’s house. The New York Times got it seriously wrong on your state! Great to hear from you, former Minnesotan. This whole Grape Salad discussion has proven a welcome diversion from winter, which arrived way too early this year in Minnesota. 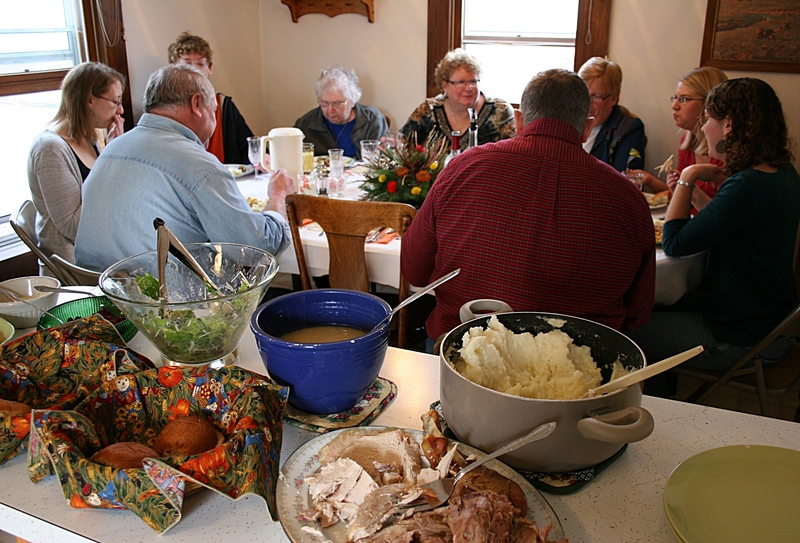 Be sure to read my follow-up post today on a Redwood County resident who started making Grape Salad for family holiday gatherings 10 years ago. Now it’s a “must” on the dinner table. I surely will. We love grape salad in my house; just never considered it a Minnesota thing. Based on the reactions of many a Minnesotan, you’re right. Not a Minnesota thing, although it may become a Minnesota salad/dessert.